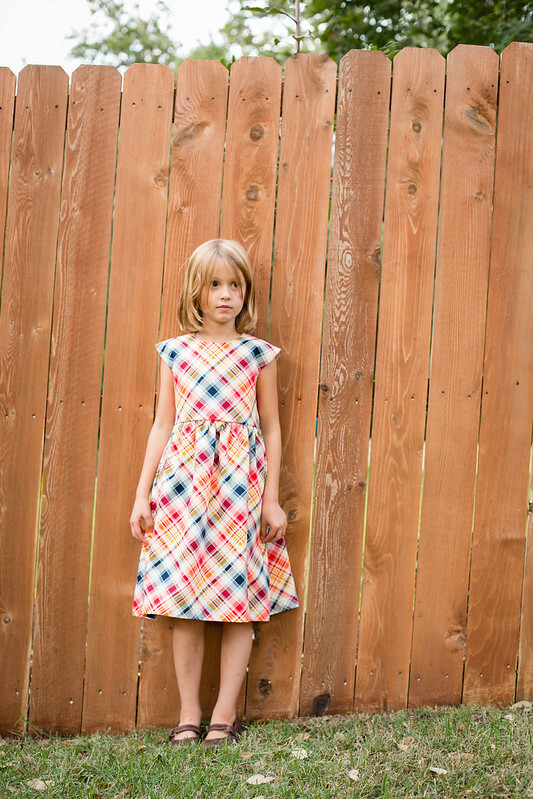 My final dress for kids clothes week is this plaid hanami/geranium hybrid for Indigo. I used the Hanami bodice pattern. But I shortened it by 2 1/2 inches and added faux cap sleeves (like last time). The Hanami bodice closes with an invisible zipper. For the skirt, I chose View B of the geranium dress. 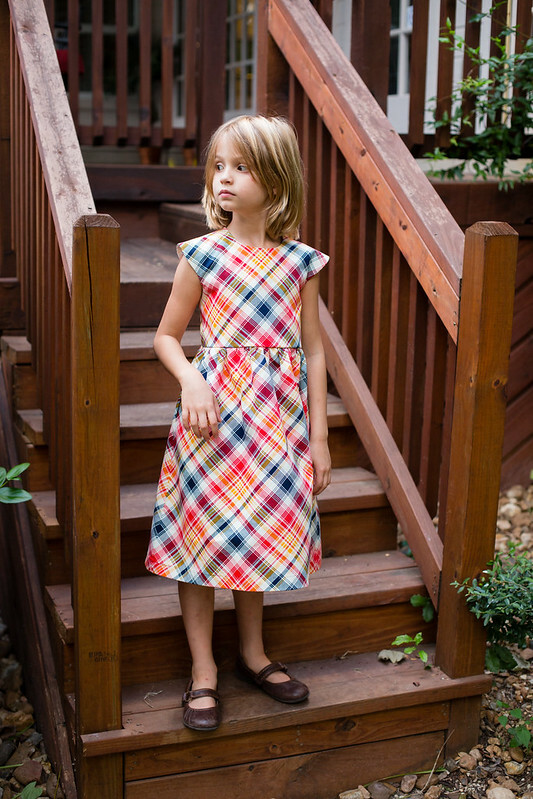 And speaking of that home dec fabric (Tartan in Midnight - in sateen), I really, really love it for this dress. I love the shape of this skirt so much and the sateen holds it so well. The geranium's view B has side pockets (called secret pockets by Indigo, since you can't really see them). I like this detail so much. I think it was brilliant of Rae to add them to the skirt pattern piece itself rather than making them a separate pattern piece. Now that both Indigo and Iris have a few new dresses, Tia's up next. So pretty again, I love the fabric. Tartan is hot in Europe this winter! 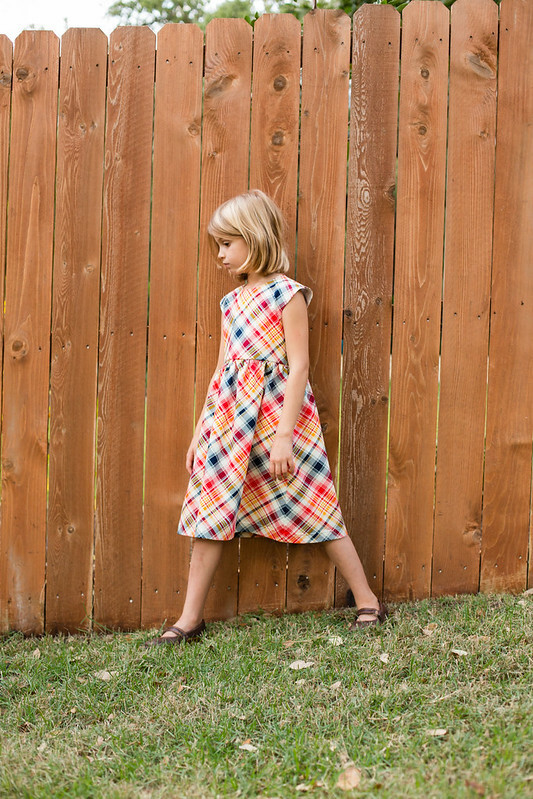 Torin, my son, aged 7 says: " I like the idea of secret pockets. I have some on my pirate coat!" The dress is AMAZING. Great job. Stopping by from KCW projects. 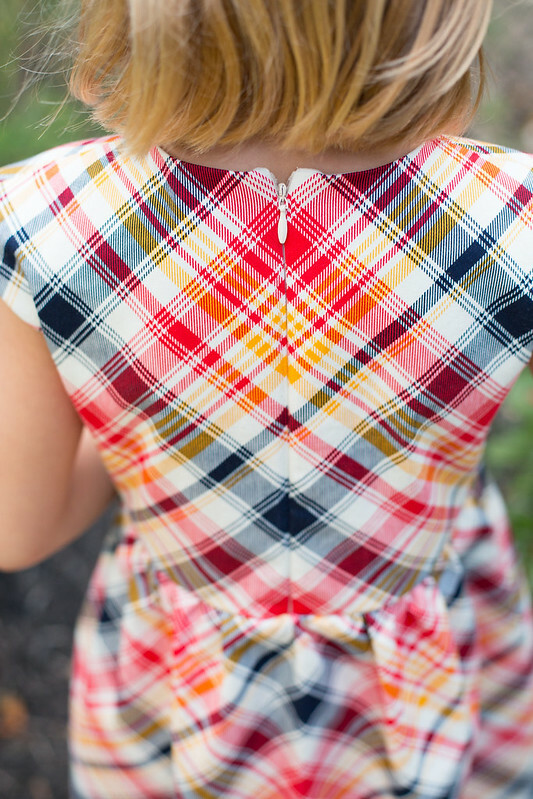 wonderful plaid dress, love the pockets! The dress is beautiful! Love the fabric and the sleeves! 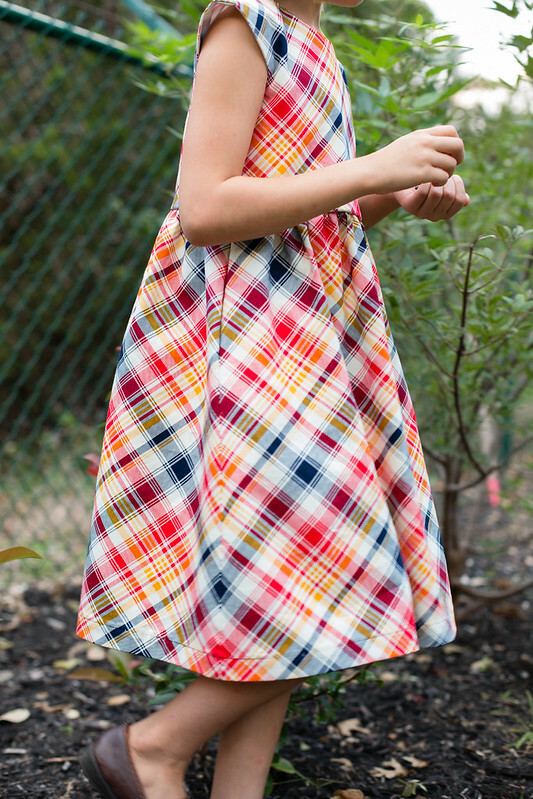 oh i love how the plaid moves around the dress, and the silhouette is great. perfect for fall. i have such a crush on you :) what great pictures and dress!! LOVE your dress! !And the plaids... so much!! really beautiful dress! I love your style! This is the most simply perfect dress. The silhouette, the pattern matching, the fabric. Bravo! Beautiful photos, and you look so young to have such a great brood of kids! 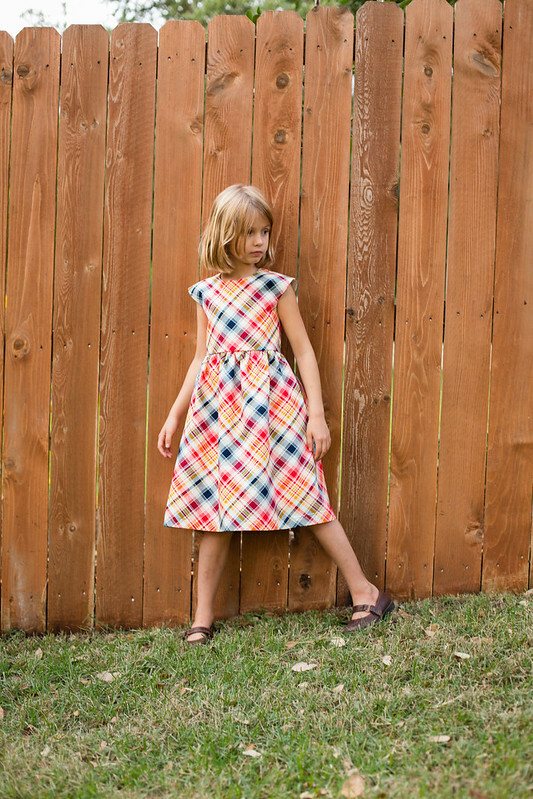 I love the dress and how you seem to be taking sewing to a whole new level! Also, LOVE LOVE LOVE seeing you in the photos with the kids. I especially love seeing Tarikua looking into your eyes with so much love! Thanks for sharing! thank you, Aleshia. she is such an engaging child. we're so blessed to have her! Gasp! This is SO gorgeous! 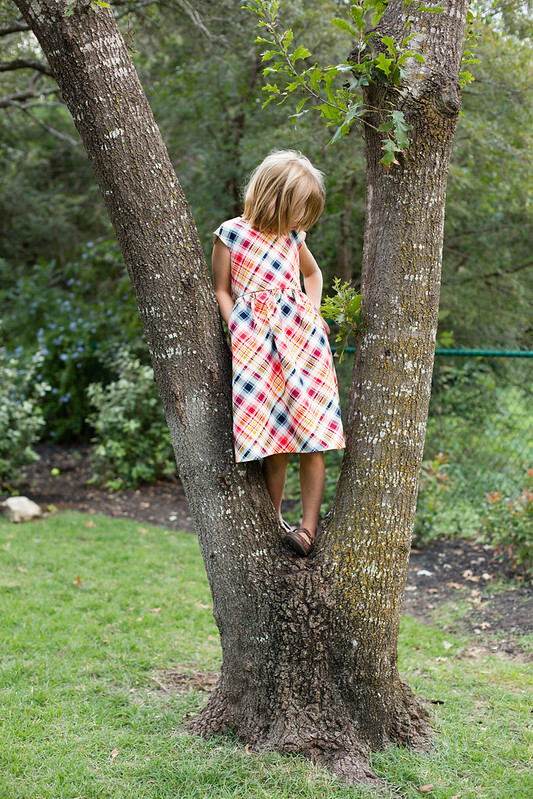 That fabric is absolutely perfect for your hybrid dress - love the plaid on the bias! And kudos for matching so well - a skill I'm working on but have yet to master:) This dress is so perfect . . . what a delightful hybrid of the two patterns. Oh, and is being an amazing photographer a family thing? Those photos are just priceless. Gorgeous dress! I can't believe I missed seeing it. I like the longer bodice of the hanimi pattern as opposed to the geranium. Love the pattern match up, too! so stunning - both the dress and indigo! i love how you put these two patterns together, and the plaid, and the plaid matching, and ... everything. you are just so good! !